A couple years ago I discovered the “Xeno” series, and have played through all the games, starting with Xenogears, playing my way through the Xenosaga trilogy, Xenoblade Chronicles and Xenoblade Chronicles 2, and finally Xenoblade Chronicles X. Although these games aren’t a conventional series by any means, with no real connection between any of them rather than the combat system and a few thematic links and characer names, I’m so glad I played them in order. Each one has been more fully realized than the last, exploring deeper questions, bringing more polished gameplay, more developed characters and worlds, and stories both more complex and more comprehensible. It’s all culminated in Xenoblade Chronicles 2, which is a nearly perfect game and may be my new favourite. 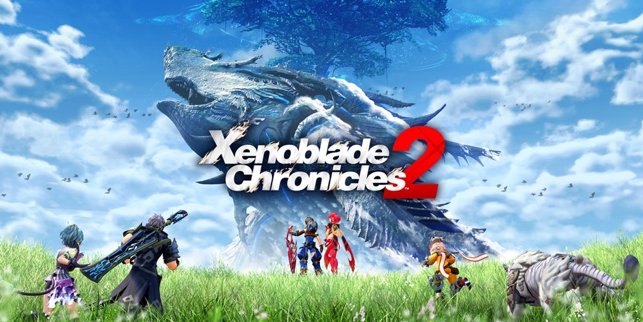 Playing through the other games in the series first made me fully appreciate what makes a “Xeno” game and how that all came together in Xenoblade Chronicles 2. Let’s look at it piece by piece. All of the “Xeno” games have super complex stories full of philosophical themes, like what is a god and where is our place in the Universe. This is what drew me to the games initially, and what’s kept me engaged with each entry. 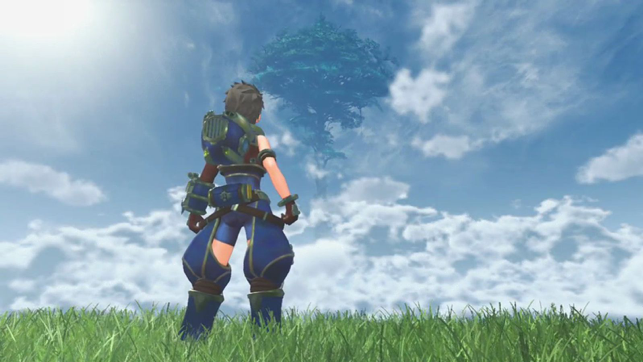 In Xenoblade Chronicles 2, you play as a boy named Rex, who is a salvager in what is called the Cloud Sea, a very cool setting. It’s a world that is essentially only made of clouds, and the only “land” is on the backs of giant creatures called titans. The story is full of depth, complete with character growth and thought-provoking twists that always kept me hungry for more, right up until the final credits. 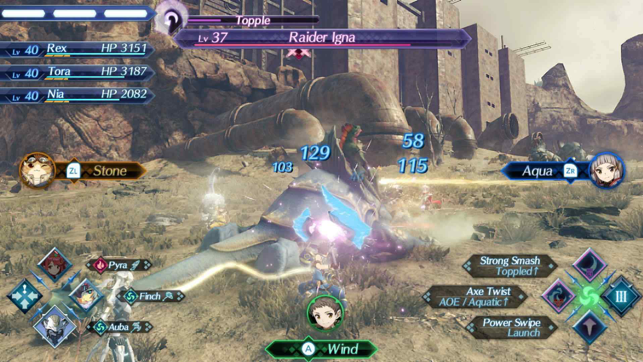 Rex is accompanied by a cast of several other playable characters. Each of them is well-developed and fully realized in their own right. The designs are very heavily anime inspired, and are colourful and varied. Each character has a unique personality that is developed over the course of the game, and I found each of them growing on me as I learned more about them. 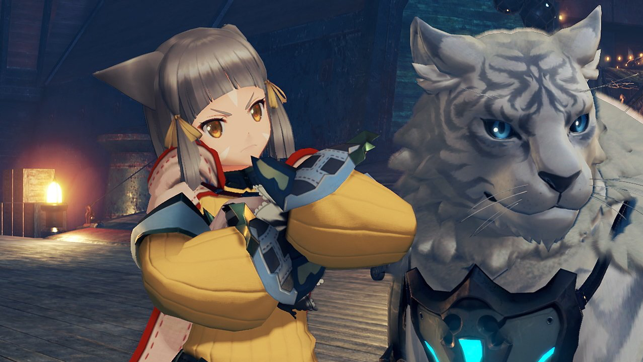 One of my favourite characters is Nia, who joins the party early. Her personal journey is full of twists and turns, and I liked her more and more as the game went on. Also, she is accompanied by a giant cat, so what’s not to love? At first, Xenoblade Chronicles 2 seems like any other open-world JRPG, but there is a lot going on here. The combat focuses on beings called Blades. The playable characters are Drivers, people capable of wielding these Blade characters. They reminded me a lot of “Daemons” from His Dark Materialsseries. (If you haven’t read those books you should check them out right now.) There are dozens of blades, and they can be customized in various ways, affecting every aspect of the game from combat to exploration. The combat is where the gameplay really shines though. It seems like every RPG these days is trying to bring in a new, more MMO-like active battle system, discarding the proven turn-based system RPGs have relied on for decades. Xenoblade Chronicles 2 is the only one I’ve played that nails it. It feels like a combination of the immediacy and precision of an action RPG with the careful strategy of a turn-based system. This is achieved through the auto-attack system, which is essentially the turn-based element. Once enough auto-attacks connect, your abilities charge up. So essentially the auto-attacking is just a timer dictating how often you can carry out an action (take your turn). There are many complexities to this battle system that keep you on your toes. I’ve heard a lot of criticism that the auto-attacks mean you can just let the game play itself, but in reality it doesn’t take you out of the action, but allows you to focus on your strategy and all of the complicated combo possibilities. Pretty much everything can be customized in this game. Your character can learn different abilities and attacks, equip different items and Blades, and the Blades themselves can be equipped and their abilities can be customized as well. New Blades are obtained through core crystals. And each core crystal contains a random blade, so finding crystals is exciting because you never know what you’ll get. In a full playthrough of the game I only unlocked about half of the Blades. Since they are unique characters and also a huge part of combat, it’s really fun to collect new ones and train them as you see fit. It’s like a super-complex version of Pokémon. Not much to say here. The game looks amazing, the world is beautiful and imaginative, and the soundtrack is wonderful. It feels like a AAA experience through and through. I still find myself humming the themes and remembering the stunning vistas of the cloud sea. Sure there were some downsides, like the over-leveled enemies that wander the world and wipe you out with no warning (something I found to be true in all Xenoblade games), the lengthy main quest (it’s totally worth it but it is an endurance test), and the over-the-top anime tropes that lead to some strange moments and ridiculous representations of female anatomy (luckily there are also tastefully designed characters like Nia). Xenoblade Chronicles 2 is an amazing game. The story and characters alone are reason enough to play it, and the unique battle system is just icing on the cake. I would recommend this game to anyone who is a fan of imaginative worlds, deep plots, complex customization options, and strategic battles. I would not recommend it to people looking for a quick pick-up-and-play experience as getting into the game is a time commitment and it takes many hours just to understand the various customization options and battle systems. If you have the patience to immerse yourself, you’re in for an amazing experience! I’ve been a fan of the Final Fantasy series from the time I first played Final Fantasy VII as a teenager. Since that time, I’ve played through all of the main series games from I to XV, and have replayed most of the games several times over. A note to the player at the beginning of Final Fantasy XV declares that this is “A Final Fantasy for fans and first-timers.” Since I definitely fall in the fan category, I’ll be looking at how the game measures up to the other Final Fantasy games. Final Fantasy XV tells the tale of Noctis, heir to the throne of Insomnia. 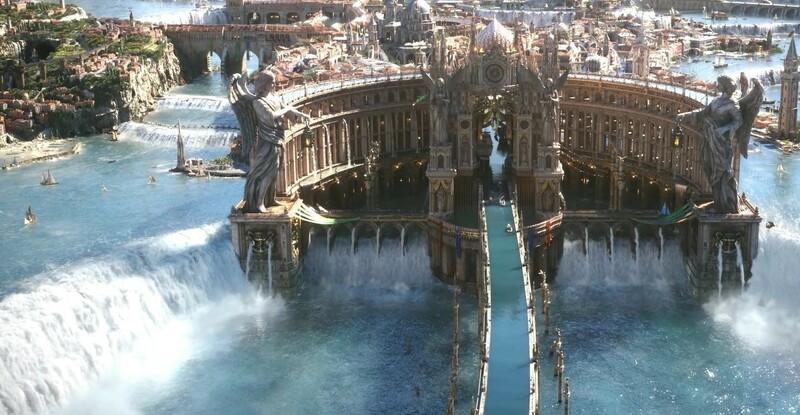 His father’s kingdom has been at war with the oppressive Imperial army when the game opens, and in the early moments Noctis sets out on a lighthearted roadtrip with his friends to attend his wedding to Lunafreya, a union that will bring peace to the world. As far as the story goes it is very solid, and full of final fantasy tropes, but plays it pretty safe. My favorite Final Fantasies are the ones with complex and bizarre plots. It gets there at the end, but overall, the story is very tight and is one of the only Final Fantasy plots I understood on the first playthrough. I think part of that was due to the tight story (which only takes about 25 hours of gameplay to complete), but also in large part due to the fact that the second half of the game doesn’t allow you to get lost or get distracted by sidequests. You stay focused on the story, which I found perplexing at first, but ultimately I really liked it because it let me experience the story in a way I rarely do with video games, because I wanted to see what would happen next more than I wanted to get to the next level or fight the next boss. The game is basically on rails for the second half of the story missions. It’s weird, but it works. And it’s not as limiting as it sounds, because you can go back to the overworld after completing the main story. It’s really the best of both worlds. Solid storytelling and open world freedom—just not always at the same time. 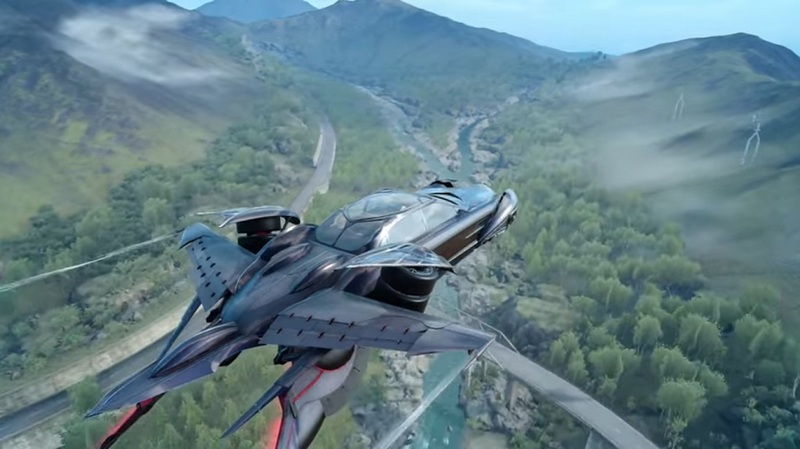 The world itself and the graphics in general are beautiful, as we’ve come to expect from all Final Fantasy games. And as you’d expect from the latest entry in the series, it has some of the best graphics of any game to date. I’ll get into this more later, but the open world was one of the things the game bragged about the most. Launching on the heels of the poorly-received FFXIII, which was criticized for being on rails, FFXV makes a point of letting you traverse an open world. 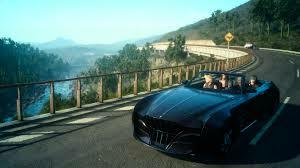 But while the world is open, you are on the rails of the Regalia, Noctis’ car. The vehicle is used for transportaion, but you can’t actually drive, so you loose the magic of earlier Final Fantasy games. The world felt truly open and epic in those games because you could fly to any point you wanted at any time in an airship, and you got a view of the larger world and how its locales were connected. While FFXV does feature multiple continents, and the cultures on other continents feels authentically foreign, these other continents are only accessible at certain times in the story, and not accessible by car, i.e., not part of the limited open world. Think about it–how restricted would you feel in real life if you could never go anywhere you couldn’t drive? That’s what it feels like in the game. There is plenty to do and see, but you know you’re missing something across the sea. Combat in FFXV is really fun. As heir to the throne, Noctis is favored by the gods and essentially gets super powers. He is able to wield super strong weapons that his ancestors once fought with, and he has an awesome warping ability which lets him teleport out of—or into—danger. Magic is pretty bad in this game, even when the skill is developed, because it’s a limited resource. This was disappointing for me as I’m a black mage at heart and always choose the mage/wizard in any RPG when given the option. But Noctis has his own powers which are very magical and awesome, especially in the later fights. You get put in positions where his warping ability has an opportunity to shine. If I had it to do over, I would focus on the warping ability from the start as it was my favorite part of combat. 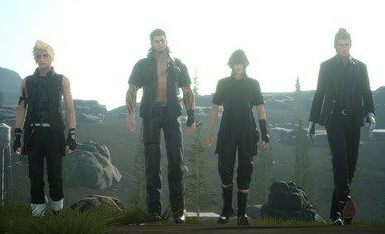 In addition to Noctis’ abilities, he also relies on his three companions to perform teamwork abilities that are stronger than the characters’ individual attacks. I neglected these abilities at first, but as I got farther in the game, these attacks became essential. A huge theme of this game is “friends on a road trip.” This means that a lot of time is spent in the car. And this brings me to one of the things that really bothered me about this game. You can’t actually drive the car. That’s right. There’s an auto mode that makes you wait as you watch the car drive for several minutes through the countryside. It’s an obvious ploy to make you appreciate the scenery, which is a great idea, but is frustratingly boring after the second car trip. There’s also a manual mode, but the manual part is that you control the accelerator and brakes, except you max out at a low top speed and auto-break and steer when you approach the edge of the road or any obstacle. So the car is essentially on rails at all times. I would be fine with this if it only happened once in a while, but it happens all the time, and I am still finding myself stuck in the car even as I clean up sidequests after completing the main story. I was cruising down the road on a long drive headed for a level 25 story mission. About halfway to the destination I was super bored and the characters suggested we stop for a break to do a side mission. I was sick of driving so I agreed to stop the car. This involved doing a U-turn and driving farther away from the distant story mission. When we got to the sidequest, we were instantly swarmed by level 47 soldiers and level 30+ creatures. I ended up wasting items I needed for the story mission just trying to run back to the car. Then when I reached the car, so much time had passed that the sun had set. At night in this world overpowered demons take over, so I then got swarmed by said overpowered demons. The idea is to camp at night to avoid getting massacred, but at this point I was so off track that I didn’t care about what I was supposed to do, I just wanted to get to the $#%@ story mission. There were no camps within walking distance, and the car was blocked by a demon, so after dying and reloading, and eventually waiting til morning, I finally got back on the road and the characters immediately asked to stop again to take a photo. I understand the road trip idea, but driving on rails and camping just slows the game down without adding anything valuable to the experience. The road trip theme is cool in theory, but in reality it’s just boring. Stopping at night further breaks the game’s flow and often just made me impatient and frustrated. 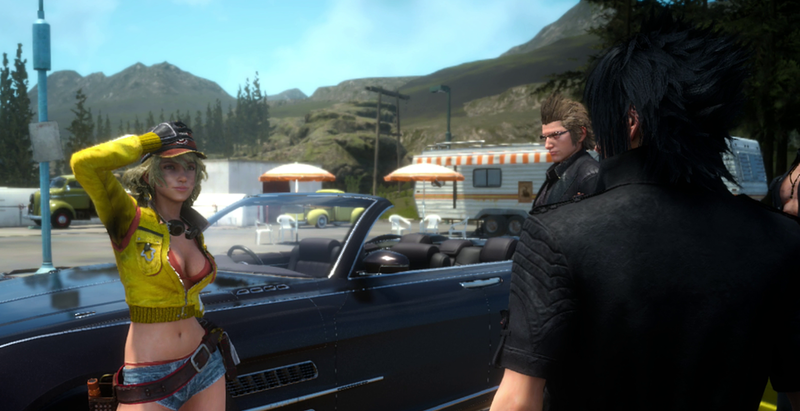 A lot of people said they bonded with the characters while camping or on the road, but a majority of the discussions are hollow dialogue about things like whether Prompto has a shot with the scantily clad mechanic, Cindy, who is probably the most prominent and frequently reoccurring female character in the game other than the leading lady Lunafreya, who rarely appears outside of flashbacks. And wow is Cindy scantily clad. She works on cars in a bikini covered by short shorts and a tiny, tiny jacket that allows her “cleavage” (is it called cleavage if most of the girls are visible?) to lean into the windshield when she wipes the car down every time you bring it in for service. This is even more offensive because there are so few female characters in the game. The only male character who shows close to as much skin is Gladio, but his open shirt suits his carefree tough-guy character. The only thing Cindy’s clothing choice confirms is that the fans and first-timers this game is aimed at are clearly intended to be prepubescent boys, which is a huge turnoff to everyone who doesn’t fall into that category. In addition to the car, the lack of diversity in playable characters was a major turn-off for me. As a gay man, I’ve never felt comfortable around boys-will-be-boys locker room talk settings like the one fostered by the leading boys of the game. I don’t expect to see representation of every type of person in every game, but not even seeing a female playable character makes me and and any one else who’s not a heteronormative guy feel weird and even unwelcome on this brotrip. Diversity is super important in all media, but it’s especially crucial in fantasy. One of the most prominent fantasy tropes is the team of unlikely heroes of various backgrounds coming together to fight off evil in the world. Elves and dwarves, magic users and mage haters, the list goes on and on. This has been represented in almost all Final Fantasy games as well, with the excitement of meeting new characters along the way and selecting a party you want to travel with. But here we are stuck with these four guys of the same age, background, etc. Maybe I’m just spoiled by games like Dragon Age Inquisition where I was able to have an all queer characters party, but I was disappointed by the lack of diversity and the lack of choice in the characters. Also, the four leading boys wear all black, and this was just one more monotone in a flat character palate. I didn’t know the difference between Ignis and Prompto until the final chapters. Aren’t RPGs supposed to be about playing out a role, imagining yourself as part of a story? When there are so many barriers to seeing yourself in a story, it’s hard to connect on anything more than a superficial level. The villain is great and reminded me of Kafka from FFVI. He is sick and twisted, and has a great backstory. He gets super creepy in the final chapters, and at one point it feels like you’re trapped in one of the Saw movies. This kind of threw the tone from fantasy to horror for a moment, but it was really only an interlude so I think the variety was actually pretty cool in retrospect. There is a tradition in the series of combining elements of different genres. The First thing I did after I beat the story mode was to hunt down the items needed to update the Regalia into an airship. As soon as it took flight, I was able to finally steer it the way I had wanted to all along. Looking down on the landscape, free from the frustrating monotony of the roads that I couldn’t really drive on, was a great feeling. It was pure joy. 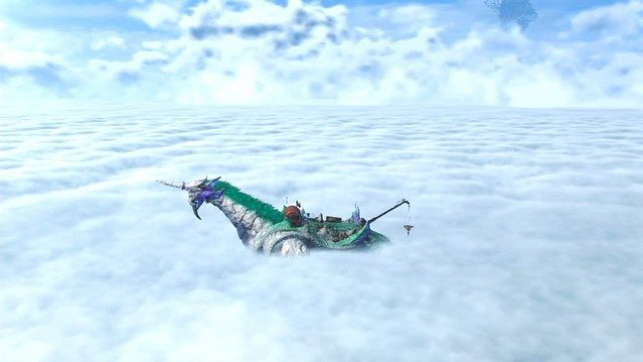 Many of the best Final Fantasy games have featured this type of transportation, often as the primary means to get around the world. It’s a great addition to the game and I will be flying the Regalia instead of “driving” it on all the sidequests I have yet to complete. Still, I was disappointed I couldn’t fly through the whole game. This would have turned the often frustrating and boring driving segments into fun, exciting, and nostalgic moments. In trying to determine how FFXV stacks up to the rest of the series, I reevaluated my own rankings. At first, I made a list of all the games and put them in two categories, “good” and “great.” But then I crossed off those categories and replaced them with “classic” and “unique.” “Classic” being the games about crystals and four warriors of light that recycle and update the classic Final Fantasy story and mechanics, and “unique” was for games that tread into new territory. Some of these games that tried new things include FFII, which fell flat in my opinion, and more recently, FFXIII, which tried a lot of new things and was not very well received. But it tried. Other games I put in the “unique” category include some of the most beloved entries in the series, like VI and VII, proving that sometimes the risk of straying from the known can lead to the creation of something monumental. After a lot of thought, I placed FFXV in the “classic” category. There are crystals and four warriors, and even the character progression isn’t really new, using the modern staple of the sphere grid mechanic. The lack of character choice, and female characters in general, feels like a huge leap backwards for any modern game, dragging down what would otherwise be a perfect modern adaption of a classic series. That lack of inclusivity, in combination with the often frustrating raod trip, hinders what could have been one of the best entries in the franchise. As it stands, Final Fantasy XV is another impressive, yet flawed game in an amazing series. This is the kind of book that you read all at once and then keep close at hand to keep referring back to. 2016 was a great year for gay spec fic, with stories by veterans in the field such as Richard Bowes, and new-comers who are on their way to becoming the next big thing, like Sam J. Miller. 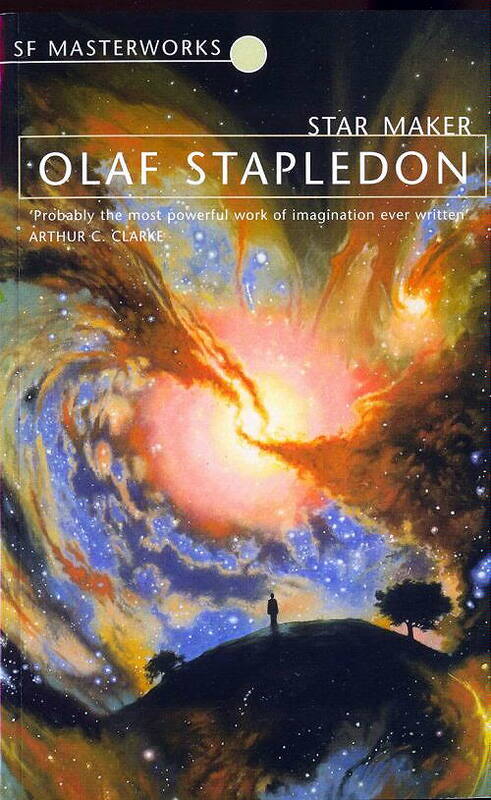 The stories collected here are wonderfully diverse, from spaces of the imagination in the near future to the surreal. These stories were largely published in major magazines originally, so I’d read a few of them before. 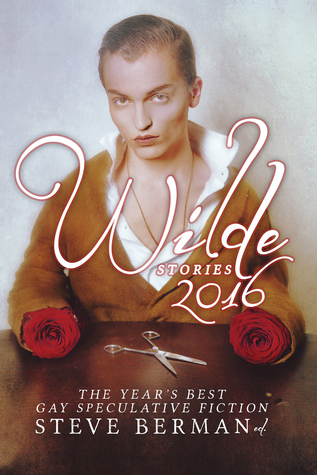 But this collection is valuable in itself because it is a wealth of brilliant spec fic stories featuring gay characters. So often I feel strung along by bromantic novels that end happily ever with the main bro meeting a pretty girl in the final chapters. It’s a relief to suspend that hesitance I approach every story with, not wanting to be let down yet again. I’ve heard from a lot of people in response to my Erasure post which I wrote over a year ago about turning 30, erasing stuff, and how we’re not getting any younger so I was going to carpe all the diems, make mistakes, and learn Portuguese. One of the best responses was from one of my oldest friends, Abe, who sent me a giant eraser and some comics I drew of our group of friends in high school. Good times. 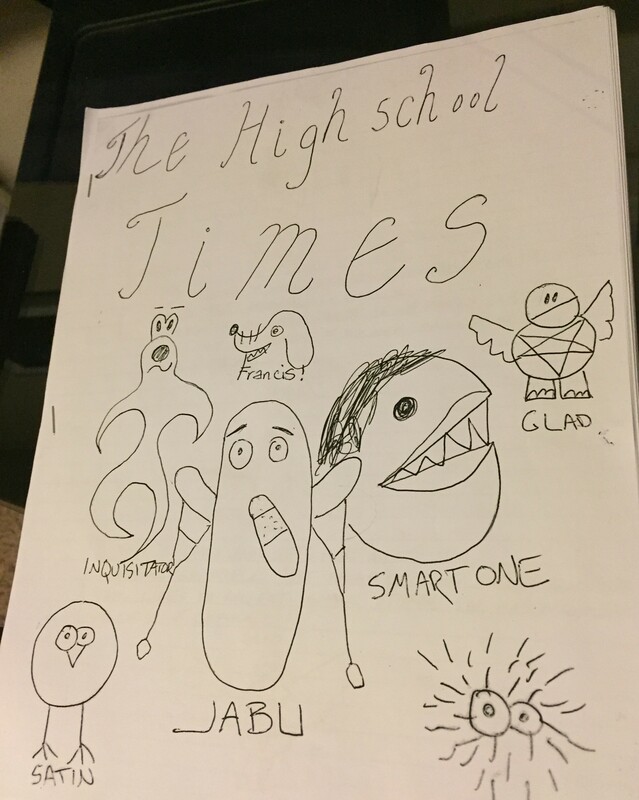 Actually, the comic was aptly named: The High School Times. Anyway, Abe recently started a brilliant blog, which you can read here. And you really should because he’s a brilliant, insightful writer and all around awesome person. So, a lot of things have happened since I wrote that Erasure post. I’m now headed toward 32, and not really worried about being 30 anymore, and the Portuguese thing got complicated. It’s actually a pretty funny story. Last fall I went to Montreal. Hilarious story, right. Wait, here comes the funny part. 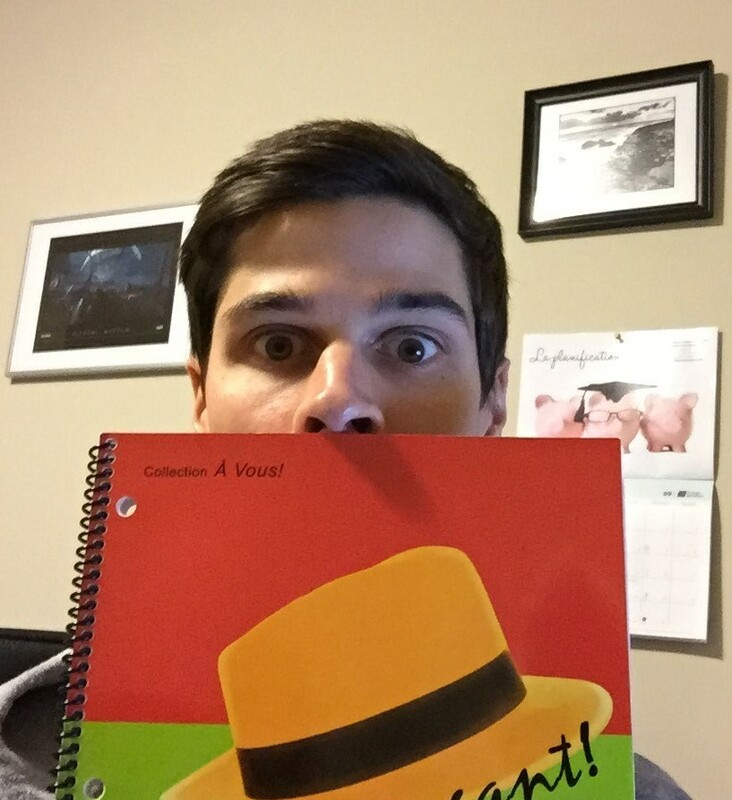 I have never had a desire to learn French. While my mother and both of my sisters studied French in school, I studied Spanish. When my friends traveled to Paris in college, I studied Japanese. When I finally went to Europe, I avoided the continent all together and stopped in Ireland. 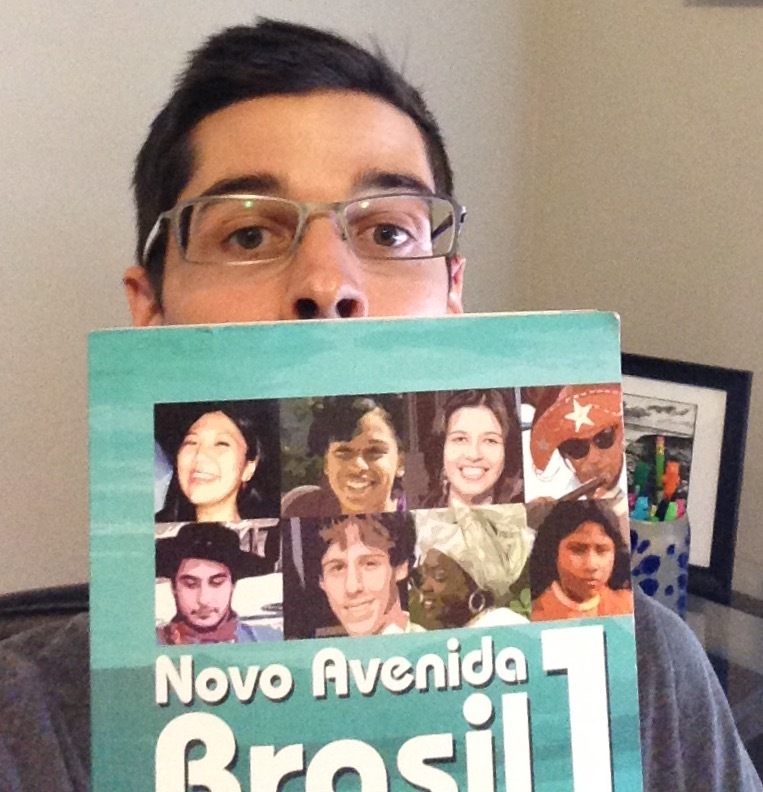 So anyway, there I was in Montreal with my Portuguese textbook, ready to use my spare time on vacation to complete the last few exercises. Then things got French. Fast. People in Montreal that I talked to were all bilingual, but I quickly felt myself falling for the charms of the language and the culture. I’ve always dreamed of spending time in a place that would challenge me to speak another language, yet I’ve been feeling a pull back east as I get older too, and feeling like there is limited time to travel to new place while still staying connecting to all the places I’ve been. Quebec is lovely and hilly and mountainous, there are huge deciduous trees and all those wonderful things I miss about the east coast. Being in that place sparked memories of my past and reminded me of the future I’m chasing. 1) I got to take French for free through a government funded French for Immigrants program. It feels like I’m learning a lot faster than I was learning Portuguese through studying on my own. 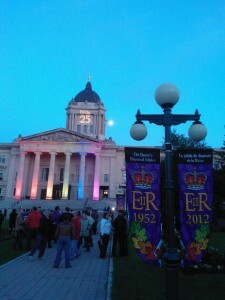 2) I live in Canada. French is by far the most useful second language for me to know. It’s useful at work (when visiting Montreal) or just whenevs I feel like Frenching. That’s what they call it, right? I think there was maybe a 4), but I forget. First, I have to say I was provided a free copy of this book in exchange for an honest review. This collection combines two of my favourite things—fairy tales and scifi. I’m fascinated by the intersection of fantasy and science fiction, and it’s really cool to see fairies translated into aliens, magic into technology, and ancient stories into futurescapes. Each story in Circuits & Slippers seeks to explore this question in some way. Disclaimer: It’s really hard to review a collection of stories. Even in a collection by a single author, each story is a separate work with its own world, characters, and objectives. Since I can’t go into all of them here, I’ll just give you a little taste of what you can expect overall. The anthology opens with “The Slumbering Hill,” a Sleeping Beauty retelling that sees Saira, a tech scavenger from a place called The Pits, journey across a desert to find a cozy town without tech where she discovers “fabric not yet made into clothing, seeds not yet grown, and ingredients not yet made into food.” The story is full of wonderfully imaginative details like these, and there is also a story within the story, a type of legend referred to as a “star story,” which is an answer to the earlier question as to the future of fairy tales. 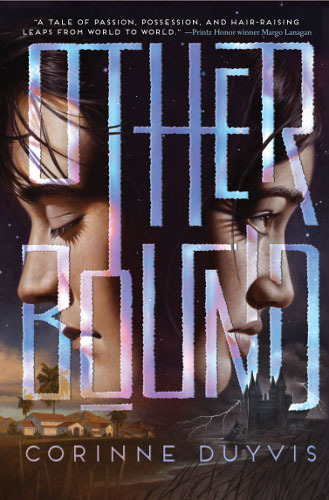 Anyway, the star story here is a scifi Sleeping Beauty tale that wraps up into the larger meta-narrative and comes to a satisfying conclusion that sets the perfect tone for the rest of the anthology. The next tale is a retelling of Jack and the Beanstalk—but the beanstalk is a space elevator. This story has a similar atmosphere to the first, a wonderful blend of fable and future. Then things take a dramatic turn with “Alone, and Palely Loitering,” which is about Galahad, who is an “automated museum curator,” an AI tasked with filling and protecting a grail with the history of Earth after its demise. While the lore it’s based on is still central, the story has a strong scifi atmosphere (in an awesome, creepy, “what happens when we’re gone?” kind of way.) Similarly, “The Last” tells the tale of the last woman from Earth, a warrior who was salvaged from the planet’s wreckage and preserved in a tower as a specimen of humanity. Her final mission…Project Rapunzel. “CAT Beyond the Moon” mixes things up even more, with a very funny narrator who tells us about a girl named Cara who wants to attend the Newton-Nye institute, and doesn’t think she has a chance until CAT a “Creature for the Annihilation of Tragedy” comes along to help her—after getting a new pair of boots, of course. While the story is set far in the history of our own solar system, there are a lot of hilarious current references, such as the “tragic tale of the Downgrading of Pluto” which is taught to all the children in this world, and is yet another answer to the question of what fairy tales will become. Another story that stands out is “Le Trotteur,” which takes us into a future version of the Quebecois legend of Alexis Lapointe, who in this reality is a Magskater hurling across gravity-defying tracks. The story has a fun, sporty feel because it’s driven by races and speed, yet finds time to slow down to incorporate the strong flavour of French language and culture. “Fit for Purpose” is narrated by an android, which gives it a unique perspective, and there’s some interesting gender stuff going on here as the android is sexualized even though it doesn’t have a gender. Another one of my favourites, “Compatible” is a hilarious and touching story about an alien studying human hair. It involves a trans human and a “more-male-than-female” alien who can’t quite be Earth-gendered. Here is an example of the humour: “I’m just now realizing how expressive eyebrows can be. Maybe humans use the hair on their head to communicate with other humans, and that’s why they’re obsessed [with it].” Maybe you have to read it in context, but trust me, when you do it’s hilarious. These are just the stories that stood out to me, but the rest of the anthology doesn’t disappoint. There are cool scifi twists on some of the most conventional tales, like Goldilocks, Red Riding Hood, and Beauty and the Beast. And as you find yourself slipping deeper into this timeless future, it becomes clear that the stories themselves are both the questions and the answers—blending the wisdom of the past, the progress of the present, and our hope for the future. Fairy tales are timeless because, in the telling and evolving, they inspire us to push ourselves to the stars. 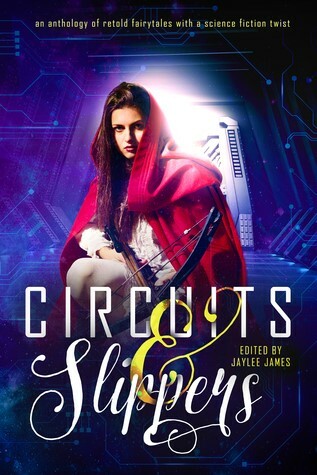 Circuits & Slippers comes out in paperback and kindle ebook on September 29th. 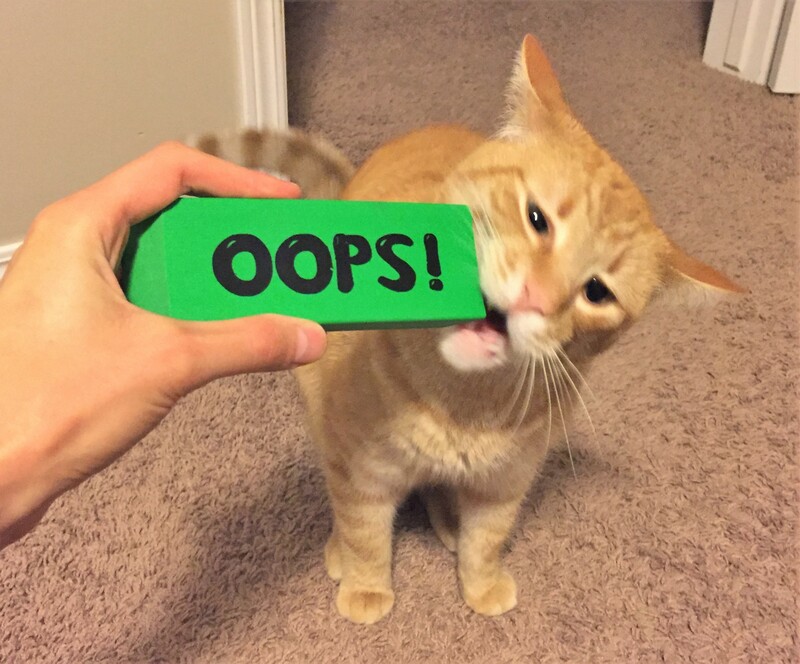 A while back my friend Will (who’s blog is awesome, seriously stop reading this right now and go check out his page) wrote about how he suddenly realized one day that he had reached a point in his life where he wasn’t expected to need erasers anymore. He gets a bit deeper on the subject but in summary, he realized that as children we are expected, heck encouraged even, to make mistakes. It’s how we learn. It’s how we grow. But then we reach adulthood and overnight we’re supposed to have our entire live worked out. No more erasers. No more do-overs. My eloquent sister on writing and where words go once they are written. Novel-writing is an act of wild optimism. It is for any writer, I think, but particularly for those of us who aren’t published. When I begin writing, I write not for an audience, not even for myself, but for the story–because there is a story that wants to be told. When I revise, though, it is with audience in mind. Will my thoughts come across clearly, my images vividly? Are these characters believable, sympathetic, real? The initial drafting is a kind of possession. The raw material of story seizes you, sinks its fingers into your windpipe, and refuses to let go. Revision is different–a smoothing, a subtle shaping of worked clay. The story is birthed and must now undergo its metamorphosis. This is the point, for me, at which audience truly begins to matter.